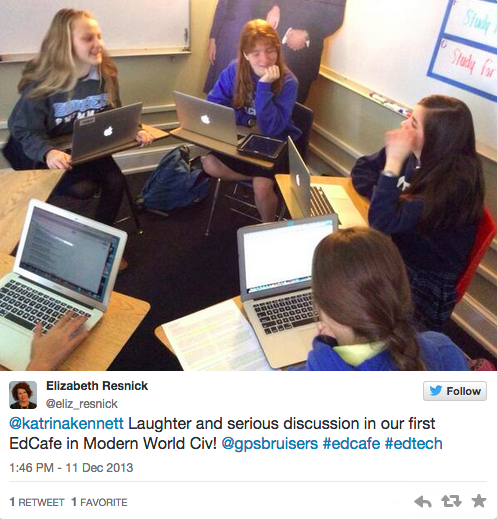 EdCafes, a powerful, flexible way to scaffold discussions, are a way to invite student ownership and voice into the classroom. Tailored to meet the needs of classrooms, EdCafes are a research-based tool to value and integrate student voice, choice, participation and leadership across content areas and grade levels. 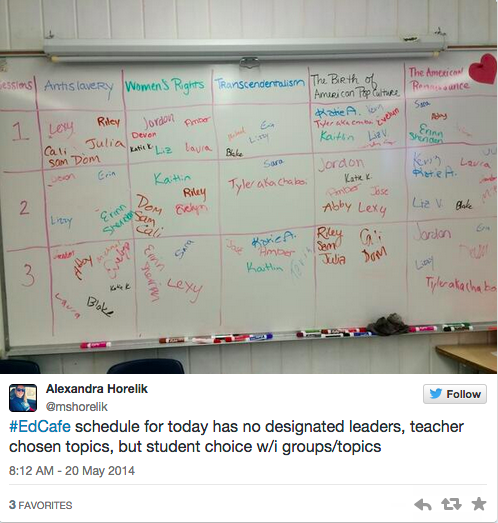 Teachers can incorporate EdCafes throughout their units, using them to access previous knowledge, work with primary sources and other texts, generate ideas for assignments and extensions, and present final work. Inviting student ownership of session topics shifts energy, engagement, and opportunity for exploration to the students, and transforms the teacher into expert facilitator instead of gatekeeper/manager. ERC can help schools incorporate the EdCafe model into their ongoing professional development, which in turn supports teacher use in individual classrooms. Teacher conversations can be structured around best practices, strengths and struggles within local contexts, work-shopping time for collaborative planning, and targeted supports for conversations teachers at your school need to have. For more information on EdCafes, see whatisanedcafe.wordpress.com. To contact Katrina Kennett, ERC’s Consulting Practitioner and the creator of EdCafes, email her at katrina@educationresourcesconsortium.org.